Ballet Dance Review - Dorian Gray: - On Tuesday 10 November I went to see Matthew Bourne's company perform Dorian Gray. Premiered summer 2008 at the Edinburgh Festival, Matthew Bourne has taken the book "The Picture of Dorian Gray" and restyled it into an updated dance adaption, "Dorian Gray". The work has been faultlessly modernised by Bourne; it shows the damaging power of beauty and the dark illusion behind greatness. The work presents a modern story of an enticing young man who is fastened in the image obsessed world of contemporary art and politics. This young man, Dorian Gray, is the idol of beauty but soon his unbroken world turns ugly. This work is entirely up-to-date and shows a whole new side to the theatre. It's stimulating yet tragically beautiful and keeps you alive from beginning to end. Bourne took a risk in his exploration of dark themes. The audience is overwhelmed with vanity, murder and paranoia. We see the affects of fame, fortune, drugs and the decline of your control. As a member of the audience, it made me realise how true it is that money can't always buy you happiness. The supporting design and music aspects of the overall performance was very successful. The dominating colour was white which gave the piece a very stark look. The set was generally pure and simple throughout the piece; it had a very contemporary feel to it and was very stylish. The revolving stage was definitely the feature that drew the whole piece in to be very modern-day. From the costumes to the set, it was all quite slight; there were no need for elaborate costumes, they were chic enough as it was. Thank you for sharing your experience with us all, the work sounds truly intriguing! What makes one aspect of the work so delightful for the audience, is how easy the story is to understand. Yet the story is not straightforward or simple, it is just carried out so well by the dancers, the set and the music, that you feel well guided through every part of the performance. Bourne has completely rethought the traditional story of Swan Lake in a crafty and current way. He focuses strongly on the royal family, relating to the themes of love and freedom, he shows how the Prince is unwillingly forced into this false system. In the opening scenes the bored Prince is strained to repeat the same empty actions - waving from a balcony to the crowds - he is protected from the world and stopped from having any real communication. The comedy throughout the work is very uplifting and leaves you no option but to smile from the light humour. A particular amusing moment is the scene where the girlfriend behaves badly in the royal box whilst watching a very funny imitation of a ballet performance. These moments are especially funny because they are incidents which the audience can relate to themselves, like when the girlfriends mobile starts ringing or when she laughs out loud - it's realistic comedy. It's definitely to clear to see that every single dancer on that stage gives everything they've got. Every single movement is given with passion and flair, there's not one dancer who isn't daring or definite. That spirit of courage let the radiant choreography shine through even more. 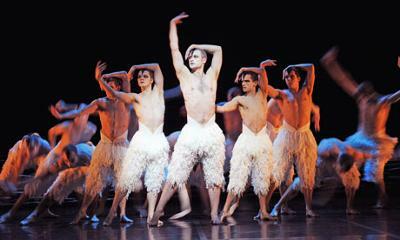 And of course, no one can talk about Matthew Bourne's swan lake without mentioning the iconic male swans. With their bare chests and low-cut feathered breeches, it certainly is an unfamiliar yet moving vision to see a corps de ballet of men swamping the stage as swans. To see their muscular and powerful bodies move around simultaneously is a memory you will remember. Even just the experience of seeing something so unique and different, will leave you feeling fully satisfied. Whether it's the powerful music and Bourne's creative response to Tchaikovsky's score, the confident and expressive choreography, the remodeled story, or the passionate dancers... Matthew Bourne's Swan is full many credible qualities that it is an absolute must see. Fantastic! It's incredible how much dance is broadening and opening so many more options for current dancers.